Understanding Calling Best Option On The L.O.S. Based upon the Option On Me rules our quarterback will have 4 options to choose from when calling best option on the line of scrimmage. The way this information is transferred to the offensive unit is simple. In the huddle the quarterback once receiving his instructions from his coach will say “Option On Me On “. Quarterback reads inverts for best option and ball will be snapped on 1. 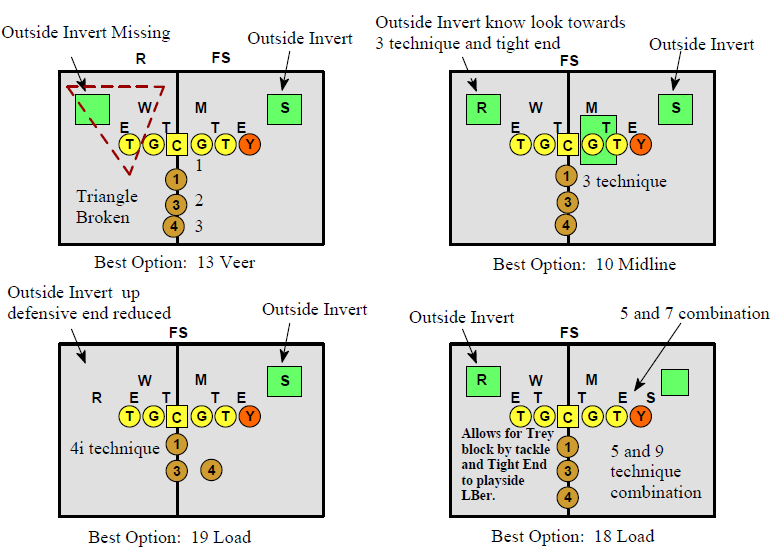 Depending upon the invert rule the quarterback can run towards the open side Inside Veer or Open side Load. Towards the Tight End side he has Midline or Load Option. This gives him 4 distinct option plays based upon inverts, 2 options to either side. The reason for reading inverts for best option is because the process that the quarterback follows for calling best option is simple and fast. The quarterback will always read from the open side across towards the Tight End. If the quarterback has an outside invert towards the open side that is located off the line of scrimmage he then knows to take his eyes towards the tight end first reading the first down lineman past the center. If he sees a 3 technique then he checks offense into 10 midline. 10 – 11 Jill: After quarterback sees that the triangle is intact towards the open side he then looks towards the tight end side for his next option. The area over the tightside guard is the area he will consider for running the midline option or 10 & 11 Jill. Quarterback needs a 3 or 2 technique for best results. Midline is best run towards the tight end because of the blocking scheme that is afforded this play. eyes on the inside jersey number. Remember, no matter what your backfield set is when playing with a tight end or slot you must have two trackers for the playside linebacker and free safety. The midline must be a play we perfect because it will force defense to reduce in order to defend this play. When defending the midline it will force defensive fronts and outside inverts to reduce, thus setting up the outside option game. Our base scheme for the midline is the Jill fold scheme which puts the playside tackle blocking out on the seven technique and the end drop stepping inside to track the playside linebacker to free safety. It should be noted that the reason this scheme is called “Jill” is because of the fold by the tackle and tight end. 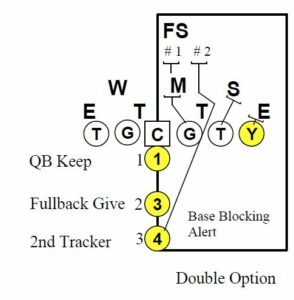 Anytime you have a combination between two adjacent linemen and the inside blocker blocks out and the outside blocker drop steps inside is known as a “Jill” scheme. If you had the outside blocker going first and the inside blocker drop stepping and going outside the down block then it would be known as a “Jack” scheme or fold. With the “Jill” scheme we will always have the ability to check the blocking rule to a “Base” alert whenever the tight end and tackle can no longer work the “Jill” fold together. The tight end will be responsible for the “Base” alert if faced with a nine technique and no one covering up his tackle. With the “Base” alert the tackle will now take first threat over the top of him. The “Base” alert puts the tailback becoming the second tracker along with the playside guard. This is know as an “Army” scheme, tailback tracking middle linebacker to free safety. The “Base” alert turns the “Jill” scheme from a triple option to a double option based upon the tight ends alert. 1. Fullback Give 2. Quarterback Keep 3. Tailback Pitch. Whenever the quarterback sees an outside invert off the line of scrimmage towards the open side he starts to look for a better option that puts the offensive line into a better blocking scheme and the defense into a position to be out numbered when defending the option game. Notice the triangle in this illustration, the defense has three defenders to defend our triple option threat with the inside veer play. In other words three to defend three. With this illustration you will find the triangle broken, in other words no outside invert towards the open side. Because most defenses will understand that they must over load the tight end side to defend both the midline and load options this opens up the inside veer towards the open side. Option on me is designed to control the amount of defenders that a defense can play inside the box. When the triangle is broken the defense only has two to defend three potential ball carriers on the perimeter. 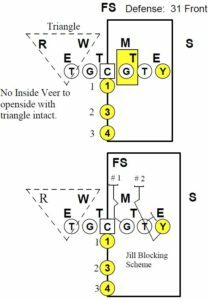 The success of the inside veer lies with the thought that the inside veer release tackle will miss or be unable to block the play side Linebacker. 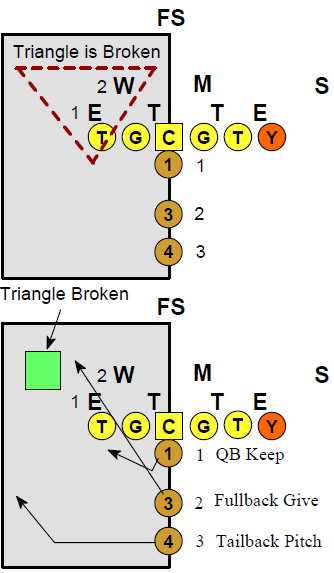 By running into the broken triangle with the outside invert missing the defense only has two defenders (defensive end, linebacker) to defend the triple option threat that the inside veer gives. 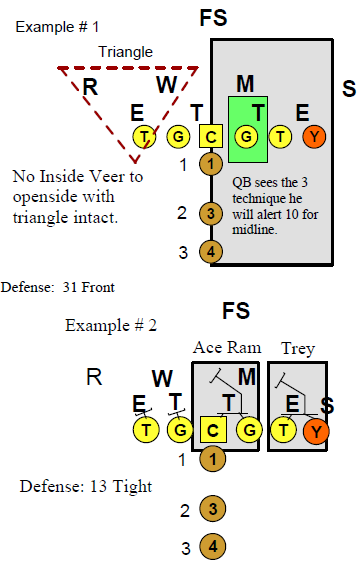 Inside veer to an open side allows the quarterback to read a 5 technique. By adjusting the outside invert to a deeper secondary alignment or rolling him over to the Tight End side sets up the inside veer. The last step for best “Option On Me” is Load Option also known as a lead option. The Load Option is the complement to the midline when defenses start to defend the midline play and begin to reduce their defensive fronts. The Load option takes advantage of a nine technique. 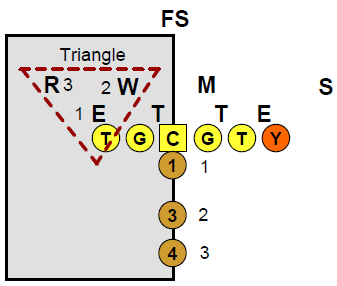 Once the quarterback sees the triangle to the open side he then looks towards the tight side for a two or three technique over the guard. If no two or three technique exists he then takes his eyes towards the nine technique for load option. then takes his eyes towards the tight side looking for a two or three technique which in this illustration he sees the three technique so he puts the offensive audible into 10, which is 10 Jill. “Option On Me” is designed to keep the offensive line in best blocking scheme and eliminate if possible mismatches with personnel. Option On Me takes advantage of defenses ganging up on the box and keeps the defense spread out. In example # 2 we find best case scenario for running the Load Option. The reason for pairing the midline with the load option is because defenses will start to reduce fronts in order to stop the midline thus, setting up the load option. When running load option into a one technique you get two combination blocks play side which helps eliminate upfield penetration. With example # 2 the quarterback would at the line of scrimmage check the audible into 18, which is 18 load option. Whenever a defense reduces to defend the midline you will get a nine technique thus, setting up load option. Whenever faced with a one technique to a five technique towards the tight end you get a counter rotating blocking scheme which keeps your offensive linemen from chasing linebackers. This will be explained in more detail with the actual play description of 18 – 19 Load Option. 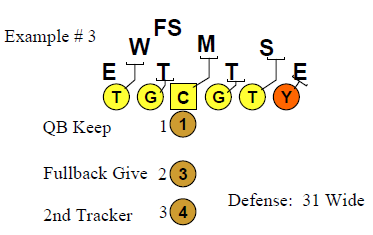 In example # 3 vs a nine technique to an uncovered tackle you get the blocking scheme being pulled over and towards the play, this tends to stretch the load option and gives the defense a better opportunity to defend the load and makes your offensive linemen have to chase the second level defenders. 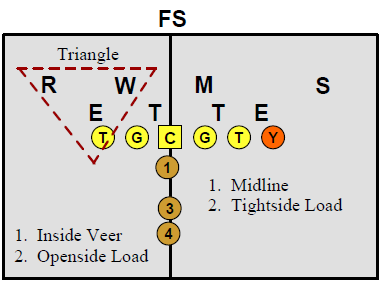 Vs a 4-3 scheme the best option is midline or inside veer depending upon what the defense gives you. It should be noted that as the offense starts to grasp the option on me concept, you then can start to include additional plays as the audible system is learned and reading inverts is mastered.